Superlative adverbs are used to profess absolute superiority or inferiority among two or more things. This superlative lesson will help you be the best at using them. 1) Superiority indicates that something is "the ___est" (the biggest, the fastest, the stupidest) or "the most ___" (the most purple, the most tired, the most important). The French equivalent is le plus ___. Note that "superiority" doesn’t necessarily mean superior in the sense of the best, but rather just the most. 2) Inferiority indicates that something is "the least ___" (the least hungry, the least exciting, the least boring). The French equivalent is le moins ___. Again, "infreriority" doesn’t mean it’s necessarily bad. The grammar involved in using superlative adverbs varies slightly depending on whether you’re comparing adjectives, adverbs, nouns, or verbs. To make comparisons with adjectives, just put le plus or le moins in front of the adjective. The superlative word itself is invariable, but, as always, the definite article and adjective have to agree with their noun in gender and number. Cet arbre est le plus grand. This tree is the tallest. La voiture rouge est la moins bruyante. The red car is the least noisy. Note that the definite article is required with the superlative even when there’s already an article in front of the noun. Otherwise, you’d be using the comparative. In the above examples, the comparison is implied – there’s some antecedent that these superlatives are referring back to. When there is no antecedent, you need de after the adjective, followed by whatever you’re comparing to. Cet arbre est le plus grand des trois. This tree is the tallest of the three. Ta voiture est la moins bruyante de tous. Your car is the least noisy of all. Or you can add a relative clause after the superlative. 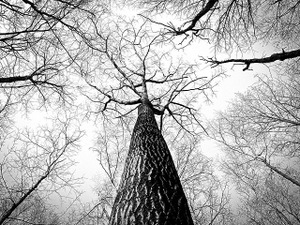 C’est l’arbre le plus grand qui existe. It’s the biggest tree that exists. Cette voiture est la moins bruyante que nous avons essayée. * This car is the least noisy that we test drove. *Why essayée instead of essayé? It’s direct object agreement. When a clause follows the superlative, the subjunctive may be required. Remember that adjective placement varies: most adjectives follow the noun they modify, while some precede it. This applies when using superlatives as well. When the adjective is supposed to follow the noun, the superlative does too. But for adjectives that precede the noun, you have a choice: the superlative can either follow the noun or precede it. When it precedes, there’s only one definite article. 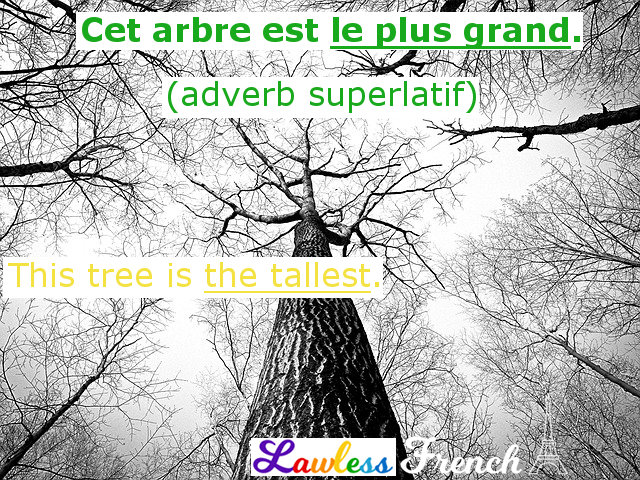 C’est l’arbre le plus grand que j’ai vu. C’est le plus grand arbre que j’ai vu. It’s the biggest tree I saw. These two constructions are equally correct; the only difference is that putting the superlative after the noun makes it a bit stronger, more emphatic. The adjectives bon and mauvais have special superlative forms: le meilleur and le pire. More about this in a future lesson. Comparing adverbs is much the same, but you don’t have to worry about agreement, since adverbs are invariable. As for placement, the superlative goes directly after the verb. Il parle le plus lentement. He speaks the most slowly. Essaie de le finir le plus rapidement possible. Try to finish it as quickly as possible. Elle travaille le moins efficacement. She works the least efficiently. The adverb bien has a special superlative form: le mieux. J’ai ramassé le plus de feuilles. I collected the most leaves. Quel jour voit-on le plus de monde ? What day do you see the most people? Tu fais le moins d’erreurs. You make the fewest mistakes. Apporte le moins de livres possible. Bring as few books as possible. The superlatives always follow the verb. Ce film m’a plu le plus. That movie pleased me the most. Quel enfant joue le moins ? Which child plays the least? Cette décision nous surprend le moins. That decision surprises us the least.